P.S. Brian, whose Camry – stolen on Alki – was mentioned here yesterday, says it was found today at 15th/Henderson. WestSide Baby‘s biggest weekend of its summer Stuff the Bus diaper-donation drive is on! Those are kids at Alki Beach Academy, where WS Baby picked up 11,083 donated diapers today! The bus also stopped at Fauntleroy Children’s Center. You’ll see it tomorrow in the West Seattle Grand Parade, and on Sunday at WS Baby HQ in White Center, where you are invited to the Stuff the Bus bash, fun for everyone (bring diapers!) noon-3 pm, 10002 14th SW. The Hill Team at Keller Willliams Realty: Welcome, new West Seattle Blog sponsor! Today we welcome a new sponsor, The Hill Team at Keller Williams Realty, led by Zack & Jodi Hill. 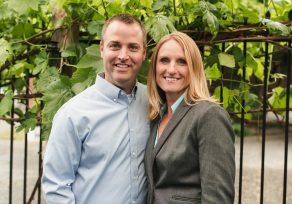 Together they bring more than 15 years of experience in buying and selling homes in West Seattle. As they say, “We live here. We work here. We invest in the community here.” Which is why they’ve hosted holiday food drives for the West Seattle Food Bank and been sponsors of both Hope Lutheran School and Lafayette Elementary. Zack and Jodi said that one the of the best parts of living in West Seattle over the years has been to have the opportunity to give back to the community. We currently have an extraordinary custom home listed in the Admiral neighborhood at 2715 37th Avenue SW. The home features stunning craftsmanship, breathtaking views, and environmentally friendly design. The green features include solar panels, an electric-car charging station, high-efficiency LED lighting, and sustainably grown bamboo floors. For more info on this home, or to book an appointment to sell or buy, you can contact Zack and Jodi – 206-412-0149 or zack@zackhill.com. We thank Zack and Jodi Hill for sponsoring independent, community-collaborative neighborhood news via WSB; find our current sponsor team listed in directory format here, and find info on joining the team by going here. 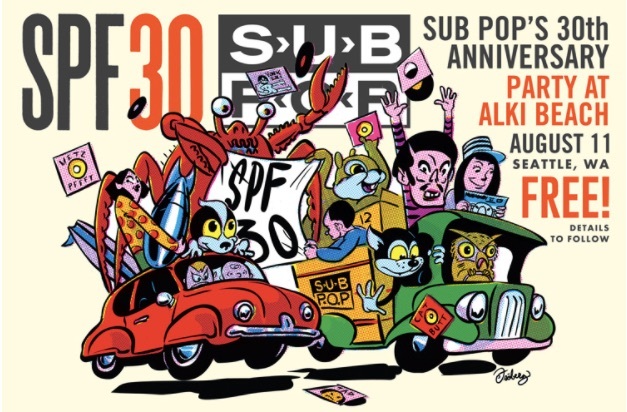 With Sub Pop Records’ 30th-anniversary party bringing thousands to Alki Beach three weeks from tomorrow, it was a primary topic at last night’s Alki Community Council meeting. Sub Pop CEO Megan Jasper opened discussion by thanking community members for asking questions and offering feedback that have helped guide efforts to minimize impact on the neighborhood. Following Jasper’s opening remarks, Sub Pop Operations Manager Gabe Carter introduced the topic of street closures, with a reminder that Alki Avenue will be completely closed to traffic between 56th SW and 63rd SW. There will also be a “soft closure” of 59th SW from Alki Avenue SW to SW Stevens Street. WADING POOLS OPEN: In West Seattle, Friday wading pools are Lincoln Park (8011 Fauntleroy Way SW), until 8 pm; EC Hughes (2805 SW Holden), noon-7 pm; Hiawatha (Walnut/Lander), noon-6:30 pm. WHITE CENTER JUBILEE DAYS: Festival continues with 11 am-11 pm carnival, 3 pm-11 pm block party – details and locations on the WCJD website. COLMAN POOL CLOSED: Today and tomorrow, the outdoor saltwater pool at Lincoln Park is closed to the public because of swim meets. AT KENYON HALL: Roy Zimmerman presents “ReZist,” 7:30 pm at Kenyon Hall. Details and ticket info in our calendar listing. SEE THE FULL LINEUP … for today and beyond, via our complete calendar! This soccer camp is for children going into 3rd-9th grade and is great for a player of any skill level. The camp focuses on skill development, teamwork and leadership, as well as life values and traits. The Chief Sealth soccer camp is led by past and present players of both the boys’ and girls’ programs at Sealth and is a great opportunity for students segueing into Sealth to meet and bond with players and coaching staff at the varsity level. For the four days, the cost per child is $100 and includes a T-Shirt at the end of the camp.